I decided to do a dark angel. This piece is one of my Kindreds, so I did not want her to be too dark, but I didn't want her all light and fluff either. 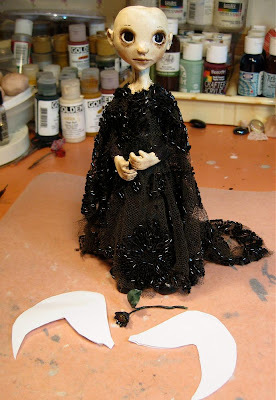 She is shown below as a WIP, with her gown (antique beaded netting), and the very rough templates I made for her wings. Below, she is getting her hair "done". Messy, messy job. Done! I am going to have to figure out what my hubby did to the settings in my camera when he borrowed it, as I am not happy at all with how my pics are turning out. Wow, Sue! She is just gorgeous. You are so talented! I love her face. :) And I know exactly how you feel about the camera. It seems like I get things working and someone flips something or changes something and all my pics are ick. :) Happy weekend! She is so beautiful. 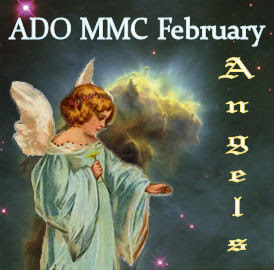 I beleive we all have angels also.. I love your doll Sue . . . those big beautiful eyes. Oooo looks like you've got big SNOW too . . . yikes! Ooo, something different..I love this one.. You do darn good under the wire girl! her face is beautiful - and the costuming is gorgeous. I love that (beaded?) black flower she's carrying. I like this dark side of you! 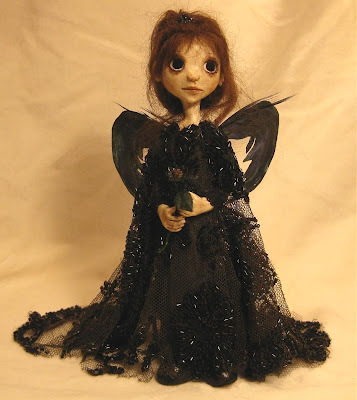 Sue your little dark Angel was soooo worth the wait!! She is adorable:) I love her dress and that sweet sweet face! Your dolls are GORGEOUS! And I sympathize with the hair situation...that's why I always make mine out of paperclay, I've never quite gotten the hang of wigmaking! Her hair turned out lovely, by the way! I love your cute dark angel! I love the way you did her wings and the dress is just perfect! Everything about her is adorable! It does look cold, but spring can't be too far off. She's beautiful Sue... not too dark but just a little bit. I believe also we have angels in our lives.... I just have to think about Renee and know it's true. You have oodles of SNOW! We were promised a storm on Saturday but luckily it passed by. 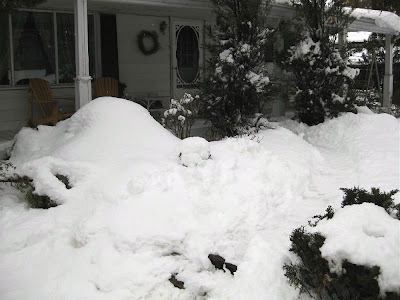 Today we are having a Spring like day, so I think I will take advantage and spruce up the front yard. 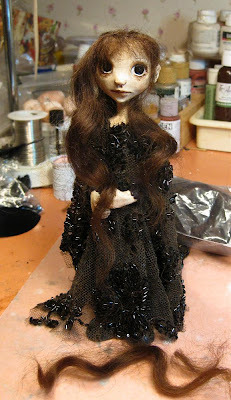 I love your dolls. 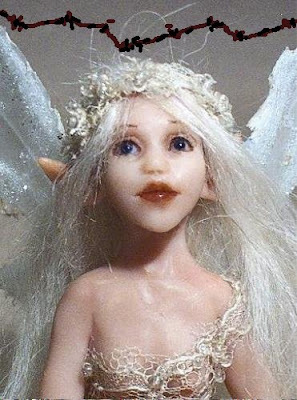 Your Fae Angel is so charming. 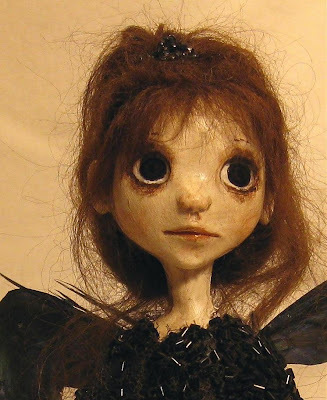 I love the eyes on all your dolls, it's as though they think and feel emotions. Oh I am such a fan!! They are all so beautiful! I like the dark one as well..beautiful! your angel turned out wonderful Sue!